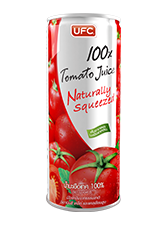 UFC 100% Tomato juice is meticulously produced with consumers who demand the natural best in mind. Finely selected domestically grown tomatoes are harvested and naturally squeeze to create the most authentic and fresh flavours. The Lycopene of tomatoes are also a strong anti-oxidant which has been mentioned to reduce the risk of cancers such as prostate cancer, cervical cancer, colon cancer, rectal cancer, and cancers of the stomach, mouth, pharynx, and esophagus. Moreover potassium and vitamin B in Tomatoes also help reduce blood pressure and cholesterol levels. Tomatoes also help diabetics to keep their blood sugar level under control with mineral chromium and strengthen bones with vitamin K and calcium contents.